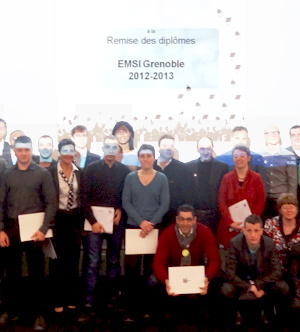 On Friday, February 21st, 2014 EMSI Grenoble held its ninth graduation ceremony, an uplifting event for the school and our newly graduated class. This year's graduating class of 119 students marched eagerly to receive their diplomas from Renaud Cornu-Emieux, Dean of the EMSI. Loïck Roche and the Alumni Team were invited to remark on the importance networking. Graduates also had the opportunity to share a moment with Laurent Janoviez. As it is every year, the 2014 graduation ceremony was a inspiring moment for both us and our graduating students as they took this opportunity to share their experiences with each other and the school. We wish all the best of luck to this year's graduating class!